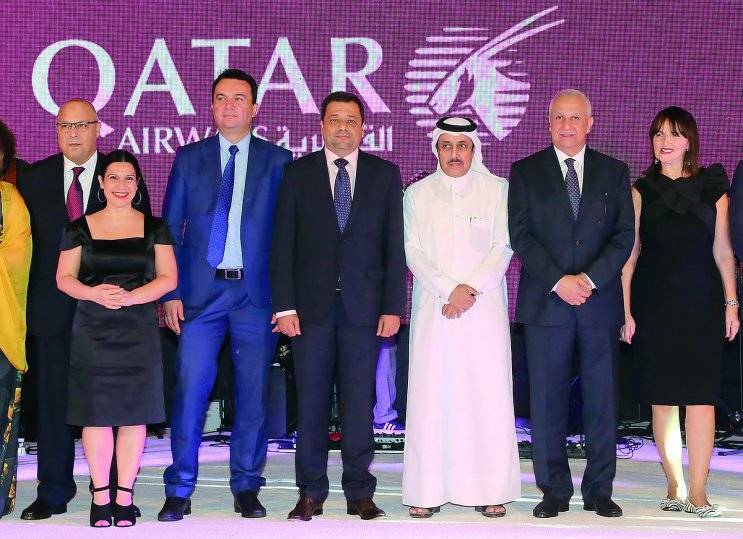 DOHA, Qatar – Qatar Airways celebrated the arrival of its inaugural flight to Alexander The Great Airport, Skopje on 17 July with a press conference and gala dinner at the Marriott Hotel Skopje. The events were hosted by Qatar Airways Chief Commercial Officer, Mr. Ehab Amin, who welcomed VIP guests including the Republic of Macedonia’s Minister of Transport and Communications, Mr. Goran Sugareski; TAV Macedonia General Manager, Mr. Alp ErTungaErsoy; Macedonian Ambassador to Qatar, Mrs. VukicaKrtolicaPopovska, and Qatari Ambassador to the Republic of Macedonia, Mr. Hassan Bin Abdullah Zaid Al Mahmoud. The gala dinner invitees, including Macedonian and Qatari VIPs, honoured guests from the travel industry and media, all enjoyed a dazzling line-up of entertainment and a headline performance by famous Macedonian singer Jana Burceska. Qatar Airways is expediting its expansion in Eastern Europe, with service to Prague, Czech Republic and Kyiv, Ukraine set to commence by the end of August. The award-winning airline is committed to bringing more visitors to Eastern Europe by adding a further level of choice for passengers travelling to or from Croatia, Hungary, Azerbaijan, and other Eastern European destinations. In response to increasing demand, flights to Zagreb increased to a 10-weekly service last year, while Budapest and Baku both increased to a 12-weekly service in June 2017. Inbound tourism to Eastern Europe is expected to grow after the airline’s route launches of Serbia, Armenia, Poland, Romania and Bulgaria in recent years. The new route to Skopje will also provide the people of the Republic of Macedonia the opportunity to connect to more than 150 destinations on the airline’s global network via its hub, Hamad International Airport, in Doha. Qatar Airways will operate the four-times weekly service to Skopje with the award-winning Airbus A320, featuring 12 seats in Business Class and 120 seats in Economy Class. Both Economy and Business Class passengers can enjoy the airline’s relaunched superior entertainment system, offering up to 3,000 entertainment options. In addition, the commencement of air cargo service to Skopje by Qatar Airways Cargo will promote air trade growth in Republic of Macedonia by connecting the country with its major importers in North East Asia via the airline’s state-of-the-art Doha hub. The cargo carrier’s newly launched Climate Control Centre enhances its seamless cool chain solutions and offers perfect transit services to support the exports of fruits and fresh produce out of Skopje to various destinations across its global network. Qatar Airways, the national carrier of the State of Qatar, this year celebrates 20 years of Going Places Together with travellers across its more than 150 destinations business and leisure destinations. One of the world’s fast growing airlines will continue to add a number of exciting new destinations to its growing network in 2017 and 2018, flying passengers on board its modern fleet of 200 aircraft.